When traveling, I like to visit the houses in which poets I admire lived. When I was in Chile in 2015, I made a point of visiting all three of Pablo Neruda’s houses: Isla Negra, La Sebastiana, and La Chascona. In Paris, I visited the flat in which Victor Hugo had lived. 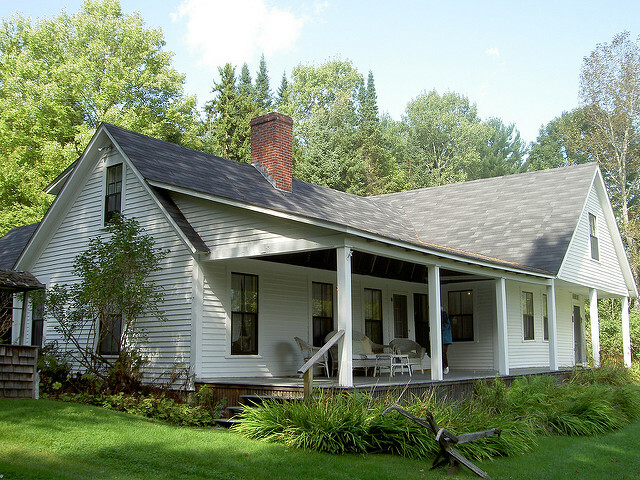 And, in Franconia, New Hampshire, I visited the farmhouse which Robert Frost occupied beginning in 1915 after he published his collection A Boy’s Will and afterwards as a summer house through most of the 1930s. Frost remains one of my favorite American poets, along with Emily Dickinson and Walt Whitman. If you look through the same window a great poet has looked through, you begin to understand something about his work. Before he died in 1963, I attended a poetry reading by Frost at the newly opened Hopkins Center at Dartmouth College. 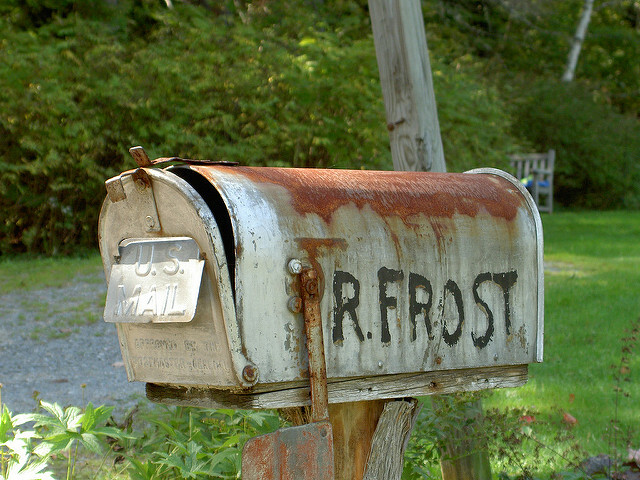 Frost had attended Dartmouth for a while, but dropped out. He also attended Harvard, but he never graduated college. As old as he was, Frost was in complete command of his mind at the age of 87. And I have been moved by his poetry ever since. I got the feeling that Frost was not the bumbling old poet who read his poem “The Gift Outright” at John F. Kennedy’s inauguration in 1961: Hearing him speak, I had a feeling that Frost knew exactly what he was doing, and had no trouble handling an auditorium filled with sharp college undergraduates. I have been looking back at some of my older digital pictures. The first vacation I took with a digital camera was to Massachusetts, New Hampshire, Vermont, and a little piece of Maine in the fall of 2005. 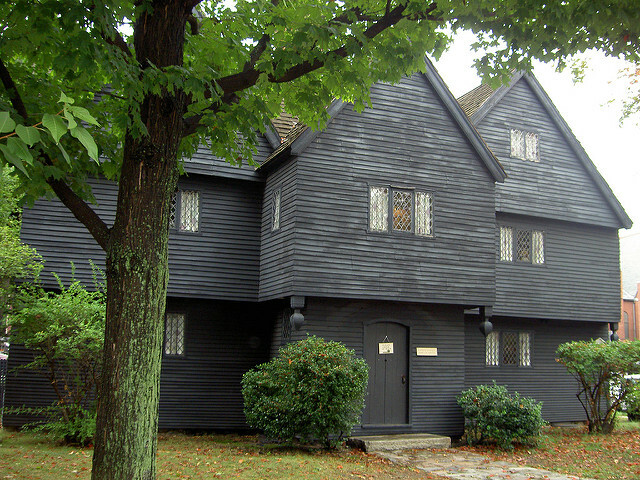 Although I had been there before, none of my destinations struck me the way Salem did. Not only for its history of witchcraft, though there was plenty there. 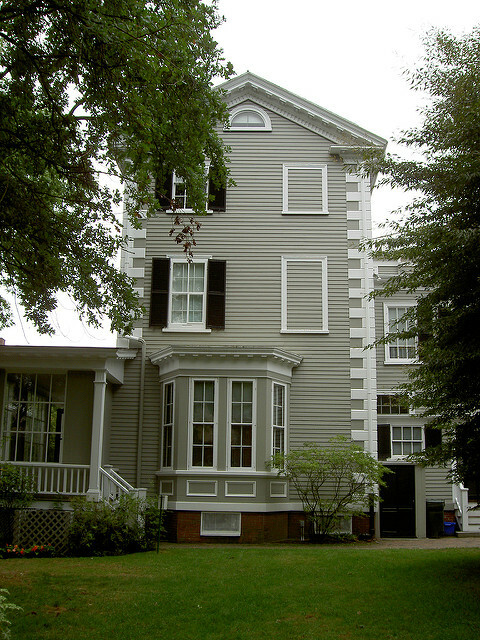 Not only for its literary history, what with Nathaniel Hawthorne’s Customs House and the actual House of the Seven Gables. And not only for its Federalist architecture, what with whole streets with houses built before 1800. Probably what struck me about Salem was the density of its historical sights, almost as if I were in parts of London or Paris. There was no doubt about it: Salem, Massachusetts, played an outsize role in American history. Its ships ranged the seas to China, as shown in the Peabody Essex Museum. In fact, I found it to be better than Boston for its highly concentrated slice of early American history. Only a short train ride from Boston, I found Salem to be a better place to base oneself than Boston. And a whole lot less crowded! There seems to be several hundred colleges in the Boston area, and the students always seemed to be using the same public transit that Martine and I were. This will probably be my last post until the end of September: Martine and I will be heading out on vacation within a couple of days. As I do not own a notebook computer, and as I have qualms about taking something so heavy and so eminently stealable with me on a trip, if I post at all, it will be using whatever computers are available to me. Chances are that any posts I might make during the trip will be unaccompanied by photographs, especially if the computers do not permit me to use my thumb drive. Not to worry, however: If the past is any predictor, I will return with somewhere between 500 and 1,000 digital photographs taken with my Nikon Coolpix S630. I’ve got the spare batteries and memory cards to flood Yahoo! Flickr with my work. A quick review of my general destinations, in order: New Hampshire, Vermont, Quebec, New Brunswick, Nova Scotia, Maine, and back to New Hampshire. We will be avoiding large cities—mainly because accommodations and food there are too expensive. The largest city along our route is Québec City. We will be staying across the river, a quick ferry ride away, in Lévis. As my vacation gets closer, I start daydreaming of being able to visit a beautiful country while being away from the constant pressures of work.It has been a hot several weeks in Los Angeles, capped off by the time we spent in a subtropical Hollywood during Labor Day Weekend. It would be a pleasure to not have to worry about the placement of fans in our uninsulated apartment at night. And then, by the time we return, it will start getting darker sooner—which means cooler nights and less heat build-up in the walls and attic. I remember my four years as a student at Dartmouth College in Hanover, New Hampshire. It was around this time of year I would take the train and bus from Cleveland to Hanover, only to arrive in an autumn wonderland of cool weather, tangy apple cider, leaves turning colors, and a kind of crispness in the air that does not exist in Southern California. News kept hammering on a massive drought and heat wave throughout the entire area, with temperatures above 100° Fahrenheit almost every day. We didn’t like the idea of vacationing in a disaster area. Los Angeles was hit with a three-week heat wave (which, thankfully, has abated somewhat). It was then that I suggested the Maritime Provinces of Canada. We had been in Nova Scotia briefly in 2008 and really enjoyed it. 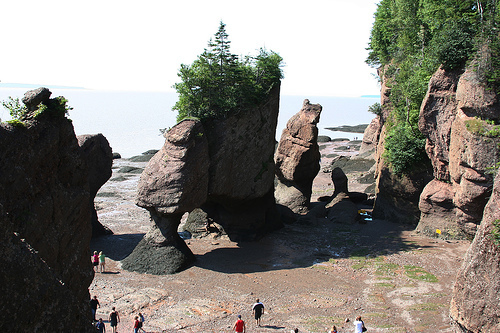 This time, we would, in addition to Nova Scotia, see parts of New Brunswick, Quebec, and Northern New England. We fly to Manchester, New Hampshire, rent a car there; see a couple of places in Vermont that we love; have breakfast at Polly’s Pancake Parlor in Sugar Hill, New Hampshire (the best breakfasts in all of Christendom); pay a short visit to Quebec City; take the St. John River Drive in New Brunswick and see the tides of the Bay of Fundy; visit Cap Breton National Park in Nova Scotia; swing south to Annapolis Royal; and return to Manchester via Acadia National Park in Maine. Despite all the long miles, it would be a good trip—and it would be in an area where the weather would not scorch our hides. On the other hand, we are bound to have a few days of rain, but for Southern Californians like us, that would be a welcome novelty. We would make it a point to stay in as many French-Canadian-owned places as possible, so that Martine could keep up her French (she was born in Paris). Because I am an impossible bookworm, I am thinking of reading Francis Parkman’s great study of the French and Indian War, Montcalm and Wolfe, from my Kindle as I travel. Canadian history is interesting in that the United States is one of the great villains: We invaded Canada twice, during the Revolutionary War and the War of 1812. Both times, we were beaten back by the British. You may be interested in this website about Sir Isaac Brock, the always outnumbered, always outgunned British colonel who nonetheless frustrated two American invasions.